You’ve had a tough week at work: the email has been down twice and the coffee machine is slower than ever. But spare a thought for someone toiling in a difficult job: using a hooked pole to haul 50-pound salmon from small boats through the open doorway of a cannery in the freezing cold…for 16 hours a day and no more than $20 a month. Steveston’s Gulf of Georgia Cannery National Historic Site is one of BC’s best industrial museums. Bringing to life the gritty working conditions of those employed in one of the region’s biggest salmon-canning plants—known as the Monster during its heyday—it’s a highly evocative glimpse at how many Richmond locals used to make a living. 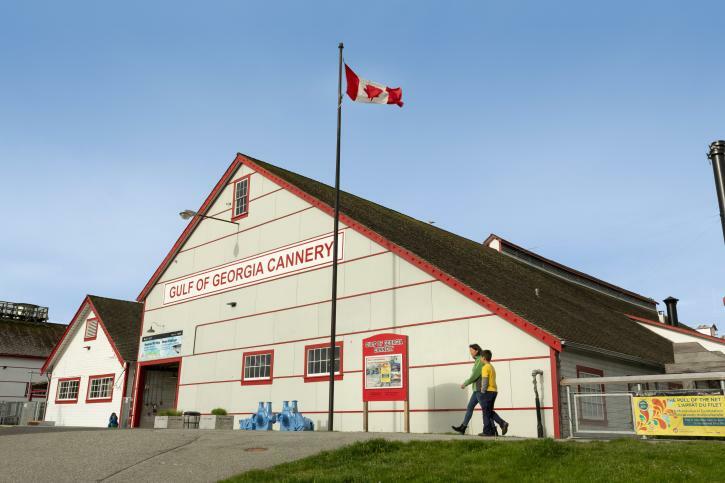 Operating as a cannery and then a busy herring reduction plant from 1894 to 1979, the site opened as a museum in 1994. Now a year-round, family-friendly attraction that’s hugely popular with locals and visitors, it has a host of intriguing ‘hooks’ to lure visitors through the door. 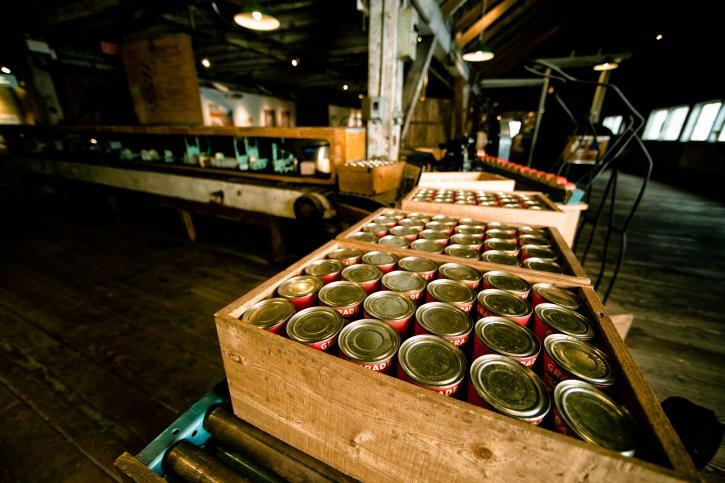 It’s easy to explore the Cannery’s exhibits for yourself. There’s everything from a walk-in boat section to a fascinating marine creature gallery to rooms filled with hulking old reduction plant machinery (complete with herring scales still embedded in the wooden walls). But the guided tours­—included with entry and running several times a day in summer—are the best way to immerse yourself in the site. With time to spare on our recent visit, we took the signature 45-minute Canning Line Tour, which illuminates the Cannery’s past working conditions. But there’s also a Machine Demo Tour, when the rhythmically-clanking old canning equipment is switched on, and a Herring Reduction Plant Tour, which explores that particular part of the operation. Check the entry board when you arrive for the day’s tours and times. 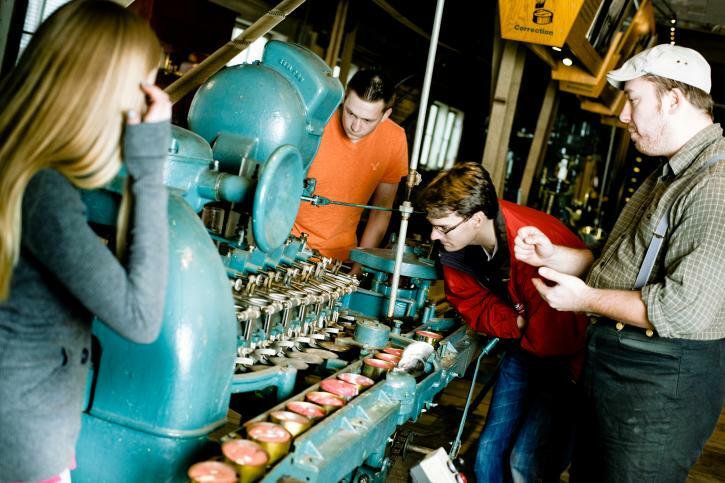 These guided tours are included in the admission price, but they aren’t the only reason to hit the Cannery this summer. Along with free entry in 2018 for those aged 17 and under, there’s a brand new must-see movie screening every hour in the onsite Boiler House Theatre. Included with admission, Ebb & Flow replaces the previous introductory movie that had run here for 20 years, telling the story of BC’s fishing industry with interviews and archival imagery. And if you’re peckish during your daytime visit, there’s also a free canned salmon-tasting table serving samples at 11:30am, 1:30pm and 3:30pm each day until September 3. The Cannery’s popular Friday night concert series is also back this summer, with shows running every Friday throughout August—tickets are just $7. But it’s the Canning Line Tour—the museum’s signature visitor experience—that most people should add to their time here. On our visit, it was led by friendly guide Antonia, dressed in the apron, headscarf and rubber boots of a woman who seemed to have just stepped from the production line to talk to us. With kids, seniors, and couples in her group, she had plenty of engaging stories about what working here was really like. There were 97 canneries in BC in 1901, including 15 in the Steveston area. The Monster, of course, was the biggest, able to process up to 2.5 million pounds of salmon per year. Up to 400 people worked here at its peak, shivering in the cold (the river ran under the wooden floor) or sweating up a storm while they worked for hours on end. Those working the toughest jobs—hooking, butchering, or cleaning fish—were almost always from China, Japan or local First Nations communities. Each job was muscle-achingly tough: women fish-cleaners (sometimes with infant children strapped to their backs) routinely developed arthritis in their hands, while butchering at the rate of one fish every 20 seconds could easily mean losing a finger. It was said at the time that you weren’t regarded as a true cannery worker if you still had all 10 fingers. But, according to our guide, there was also a very high level of camaraderie among the workers here. Photos throughout the Cannery show how close-knit the community of employees was; they worked hard and looked out for each other. Years later, many retired workers fondly recalled their time on the line and the friends they made here. 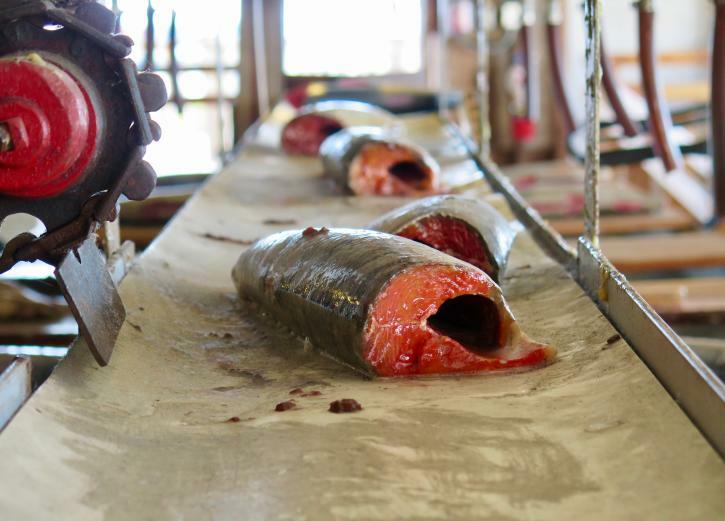 Of course, customers buying the plant’s coho, sockeye, or pink salmon around the world had little inkling of the men and women behind their meals. All they saw was the romanticized can labels on store shelves. Our guide pointed out some of these alluring labels at the conclusion of her tour, complete with exotic Canadiana images of trains, beavers and Mounties,­ as well as wildly inaccurate First Nations depictions. It was a fascinating way to end an excellent look at what life was like for many just a few decades ago. The Gulf of Georgia Cannery National Historic Site is open daily from 10:00am to 5:00pm (excluding statutory holidays between October and January). Admission is $11.70 for adults, $10.05 for seniors, and free for those aged 17 and under. Paid parking is available but the site is also easily reached via transit buses 401, 401, 407 or 410 from the Richmond-Brighouse Canada Line Station. 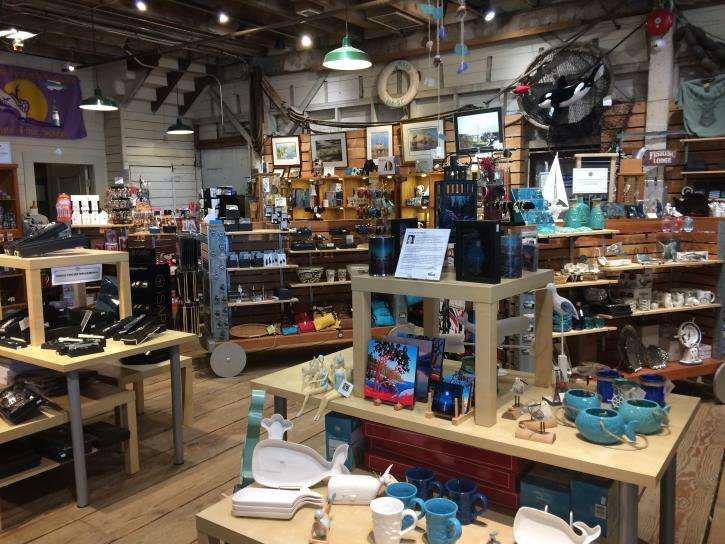 Tip: if you&apos;re looking to take some salmon products home, check out the Cannery Gift Store on your way out!